It’s time to shop for gifts and this year you want to wow your giftees. If your loved one is a gardener, you know they’ll enjoy a present related to their favorite hobby, but how many pairs of gardening gloves or hand trowels does a person need? Time to think outside the box. Luckily, we’ve put together this lists of unusual gifts for gardeners. These practical and fun gifts go beyond the cliche and will wow the gardener in your life. Beneficial bugs are important to all gardeners. They help pollinate plants, eat other pests, and make nature work. But as our modern world becomes more and more urban, there are fewer places for those good insects to live. An insect hotel like this one from Beaks & Paws is the perfect way to invite beneficial bugs into a garden. Designed with nooks and crannies to attract butterflies, bees, and other insects, this is a practical gift any gardener will appreciate. Terrariums have helped bring gardening indoors and allow gardeners to grow in interesting containers and locations. The terrariums are ready-made by Teresa’s Plants with four specially selected moss and lichen. 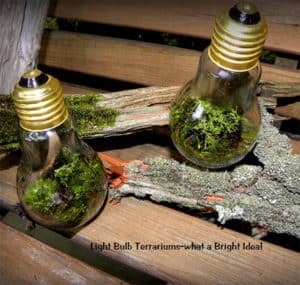 They’re displayed in a unique light bulb container–the top easily screws off to water and maintain the terrarium. This is one of the more unique and unusual gifts for gardeners we’ve seen. If you want one of the most unusual gifts for gardeners, check out this one of a kind present. 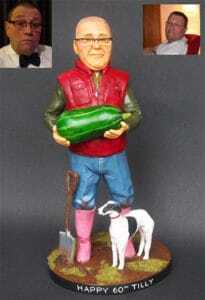 Mizog Collectibles makes custom figures based on your loved ones. All you have to do is send in photos of the gardeners and they hand sculpt an 8-9″ figure that is hand painted with realistic detail. This is more than a gift as it will become a precious keepsake. It also makes a nice memorial gift for family members who have lost a loved one. Is your gardening loved one interested in interesting plants? Chris Thorogood put together this book of some of the weirdest plants from around the world. Divided into seven categories (Vampires, Killers, Fraudsters, Jailers, Accomplices, Survivors, and Hitchhikers) these strange plants and flowers may even inspire them to do a little adventurous gardening as well. Regular flowers die, but this bouquet is forever. 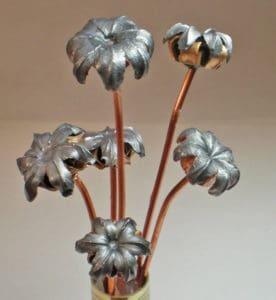 Handmade by Wild West Jewelry Shop, this bouquet features 6 flowers made from expanded bullets. They then take a 50 caliber brass case and make it into a vase. This lovely bouquet makes a romantic anniversary or Valentine’s Day gift and is perfect for gardeners who are hunters, homesteaders or anyone that enjoy western and rustic decorating styles. This is a fun and unusual gardening gift that perfect for kids or a stocking stuffer. These tiny planters are shaped like adorable animals like pandas, monkeys, and cats. Each has a long pink tongue, which when dipped in water automatically waters the plant growing inside. Each ceramic planter comes with soil and seeds to grow a plant. This is a unique handmade gift any gardener will appreciate. 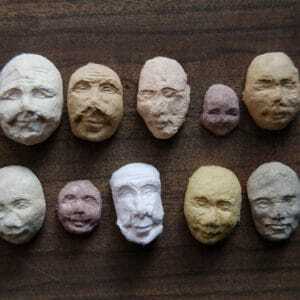 Kelsey Pike makes these tiny seed faces, made with plantable paper and edible sprouts. They come in a pack of 10 and just need to be soaked in a tray of water to grow edible, heirloom sprouts. Makes a nice stocking stuffer for any gardener. All gardeners know the struggle: you’re hours deep into weeding or planting in a muddy garden bed. Your boots are covered in mud and muck but you need to use the bathroom or run to answer the phone. It’s a hassle to take off boots to make a quick trip inside, but with Shoe In that’s not a problem. These rubber “over shoes” slip easily over boots or sneakers, keeping dirt, mud, and water off the floor. Makes a good gift for Christmas, birthdays, or Father’s Day. Enigmas Six Studio is an artist who makes a variety of interesting sculptures. For gardeners, their tree sculptures make beautiful and unique gifts. 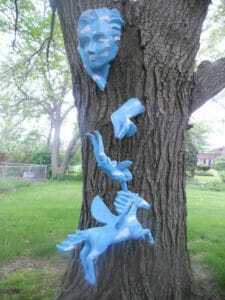 They take advantage of the tree to create the pieces which range from people to surrealist pieces like the one pictured above. These unique pieces of artwork are much cooler than traditional garden decorations like gnomes and plastic pink flamingos. If you’ve spent any time on Pinterest, you’ve probably seen could garden planters that look like a person’s head, so the plants are their hair. With the right combination, these turn plants and flowers into sculpture and decoration. There are lots of options to choose from, but we really like this Venus head planter. This is a cute, small gift perfect to give as a stocking stuffer. 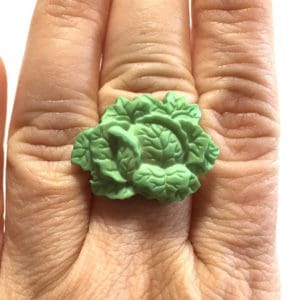 This ring features a green head of lettuce. Handmade by Tragedies Cheesecake, the lettuce is made from sturdy plastic on a silver-toned ring. This sweet piece of jewelry is a lovely gift for any gardener. Some of the best unusual gifts for gardeners are weird plants. Air plants, also known as tillandsia, are unique because they aren’t planted in soil like most plants and flowers. Instead, these low maintenance plants only need weekly watering and can be displayed almost anywhere in the home. They’re perfect for terrariums and other unique wall or home displays. This set comes with 12 assorted air plants ready. This shirt is a hilarious blend of succulent gardening and classic 90s music. Based on the MC Hammer song “U Can’t Touch This,” the funny T features illustrations of various cacti with the spikey words: Can’t Touch This. Perfect gift for desert gardeners or anyone with a good sense of humor. If the gardener you’re shopping for has mastered fruits, vegetables, and flowers, it’s time to help them up their gardening game. Carnivorous plants are fun, exotic house plants that feel a little bit like pets. In addition to water and sunlight, a pitcher plant will also attract insects and “eat” them. Makes a great gift for advanced gardeners. If your gardener is also a book worm, they will love this adorable gift. My Papercut Forst makes this miniature art piece. 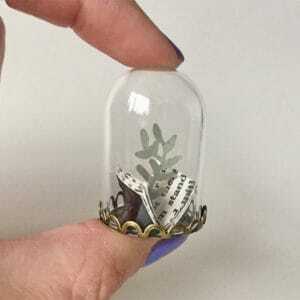 It features a tiny book with a plant growing on it. It’s perfectly sized to tuck in a stocking and display on a desk or shelf. Want more odd and unusual gift ideas? Check out the weirdest Sriracha foods and snacks and unicorn gift ideas.